Asylum seekers stand at a bus stop after they were dropped off by Immigration and Customs Enforcement at the Greyhound bus station in El Paso, Texas on Dec. 23. The secretary's visit comes as her department is under scrutiny for the recent deaths of two Guatemalan migrant children in U.S. custody. On Monday, 8-year old Felipe Gomez-Alonza died after coming down with the flu, and 7-year-old Jakelin Caal Maquin died earlier this month of shock and dehydration. Nielsen's trip began in El Paso, Texas where Gomez-Alonza was apprehended, and where Maquin died. Earlier this week, Nielsen called the 8-year old's death "deeply concerning and heartbreaking" and announced new medical screening procedures for all child migrants – both those travelling with family members and those who arrive unaccompanied. In El Paso, they are being examined at a network of hospitals and pop-up clinics staffed by volunteers. As of Friday, nearly 150 children had been screened under the new procedures and at least four had been admitted to an area hospital, according to the Border Regional Advisory Council, a non-profit that is helping coordinate the check-ups. On Saturday, President Trump blamed Democrats for the two children's deaths. Trump has repeatedly made unsupported claims about the dangers posed by incoming migrants; his controversial campaign-promise of a new border wall is at the center of congressional gridlock that has temporarily shuttered the federal government. Without citing specific numbers, Nielsen said this week that there has been an increase in sick children crossing America's southern border. Alan Shapiro, a pediatrician who treats and advocates for immigrant children told Yahoo News that the claim is "disingenuous" adding that "there's an uptick everywhere in the country of viral illnesses in winter. That's not specific to migrants." 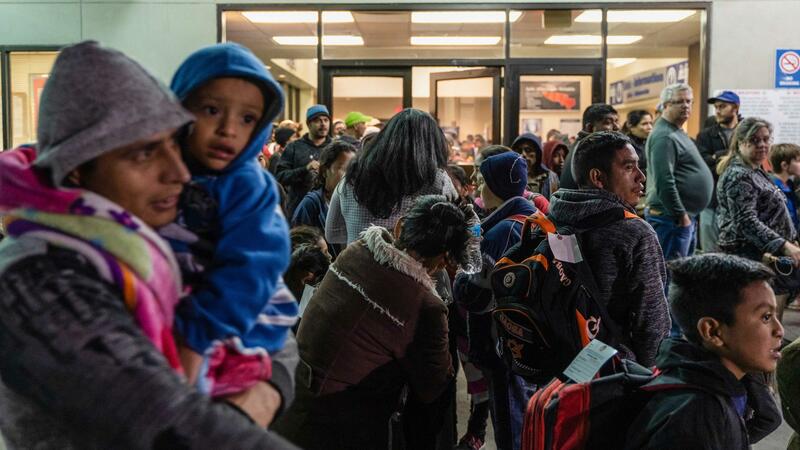 As NPR's Joel Rose has reported, bleak living conditions and a lack of sanitation inside government detention facilities can also make migrant children sick. A group of Democratic lawmakers say that when Congress returns to Washington, D.C., next week they will "hold hearings and conduct oversight of the two deaths that occurred earlier this month, as well as the conditions under which thousands of children are being held in DHS custody." In El Paso on Friday, Nielsen met with the sector chief and staff at two border patrol stations, as well as Immigration and Customs Enforcement leadership, and U.S. Coast Guard medical personnel who are advising the Border Patrol on new screening protocols. Nielsen also had a conversation with the city's Republican mayor, Dee Margo, who welcomed her visit. Margo told NPR that among the topics they discussed was the release of 400 migrants in downtown El Paso earlier this week by ICE officers. The move caught city officials and local aid agencies off-guard, as the migrants were left without food, shelter or a place to go. Margo dismissed the unexpected drop-off as a "glitch." On Saturday morning, Nielsen continued her tour in Yuma, Ariz. Details of that visit were not immediately available. Last week, Nielsen announced a new policy that will require asylum seekers at the southern border to wait in Mexico while their claims are processed. If it is implemented, more children will likely be housed in already-strained Mexican shelters, in areas where gangs routinely target migrants. Reporter Monica Ortiz Uribe contributed to this report.